So, FIFA 13 season is almost over and we are upon the horizon of a brand spanking new FIFA game brought to us by EA Sports and graced by the ever so great Lionel Messi. For me, an avid gamer and fan of the FIFA series since I can remember, the first mode I always go to is ‘Career Mode’, it’s the force of habit, I like to think I’m a manager and I like to do things my own way. That’s why I’m glad the career mode has surpassed my expectations time and time again with every new FIFA game, but what can EA Sports do this time around to give us a football game, worth more than the spherical ball. The first thing that really grinds my gears about this almost perfect career mode is the known fact that when you sell one of your players, for let’s say 28m, you receive 80% (if even that) of the fee! Since when did VAT get levied onto the manager’s? It’s quite annoying especially when you thought you got a good amount for a player to re-invest into your squad only to find out that you won’t be able to buy a player of the same or better quality. Deadline day. 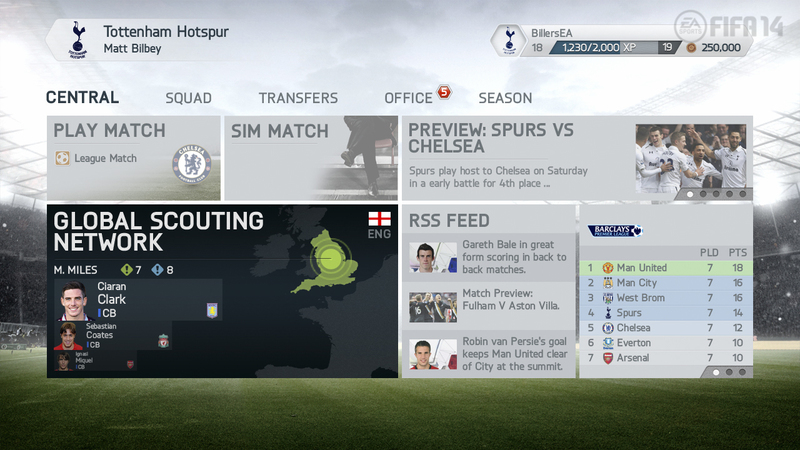 An excellent innovation and most welcomed addition to the career mode however, needless to say it is flawed. For one, the last time I checked a day has 24 hours, not 10. Ten is not enough to surface a deal for the players you need and this is especially the case when you have a big money bid for one of your players with two hours to go and no time to sign a replacement due to clubs taking 2 hours to accept bids. Its design is flawed but with a little work, can prove to be simply amazing. The youth. Credit to EA as they have tried to incorporate a fine tuned youth system into the game nevertheless it hasn’t quite worked yet, purely due to the fact that youth players are over-called at 68 and by the time they develop they reach up to 78. These youth players should compete with the best once blossomed like in real life however they are merely used as squad rotation. This needs to be fine tuned in order to persuade gamers to look to their academies. Last but not least, the last thing that needs work on is other clubs signing players. Coming from a guy who has spent countless hours with countless teams on career mode, I can’t help but see the same players transfer to the same clubs. I.e, Benzema to Chelsea, Wilshere to Man City and Silva to AC Milan. It gets frustrating when you sign 5 players and your rivals sign one player worth 1.2 million. This needs to be more realistic and by incorporating youth players, it can be. Well there you have it, regardless of whether EA decide to make the following changes or not, we are definitely in for a treat come September as the next generation of football games comes crashing down to our bedrooms and our social lives as a dire consequence go flying out the window. Well those of us who had one to start off with! Thanks to Safraz for writing this article on how he feels EA should improve on their Career mode. Share your thoughts with us via the Comment section below and on Twitter.